We will list your commodities on the internet (World Wide Web). Your samples will be seen by a large number of qualified buyers in the marketplace. 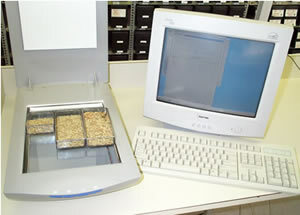 CGF produces a scanned photograph of your bin run sample, cleaned sample and dockage. We match the scanned photographs with the analysis and display them together on the internet. Buyers can then see what they are buying. In effect, CGF is creating a farmers market for your commodities. Included with the listing fee is a detailed analysis of your commodity, which we'll provide to you by telephone, fax, mail, e-mail or a combination of these. - Before harvest have prepared clean, dry, odorless 20 litre pails (complete with lids) for each storage bin on your farm. - As you are loading your storage bin, scoop from the flow of grain at regular intervals as it is transferred from the truck to the bin. Deposit scoops into the pail. - Once the bin is full (the larger the bin, the more scoops you should collect) place a lid on the pail to maintain the integrity of your sample. - Identify each pail with the bin, the quantity and the date placed into storage. Store your sample pails in the same environment as the grain is stored i.e. not heated. - Before sending a representative sample, be sure to mix the contents of the pail thoroughly. - Package each sample in a sealable bag or container equivalent to 1.5 litres (i. e. a 2 litre milk carton 3/4 full). - Be sure to identify the samples with your name, address, phone number, commodity and quantity. - Send your samples to CGF brokerage and consulting by the most efficient and economical means available (your expense), i. e. bus, express post or courier.